But, as everyone knows, Frank Robinson was the first African American to take the reigns of a Major League Team from the season opener through the post-season. 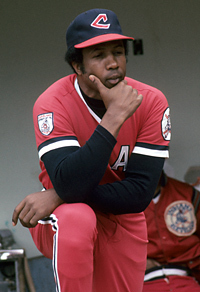 After managing in the winter leagues late in his playing career, Frank Robinson expressed a desire to become a full-time Major League manager. The Cleveland Indians responded by hiring him as their player/manager for the 1975 season, making him the first African American manager in MLB history. Robinson would go on to manage for most of the next 25 years, for teams including: Cleveland (1975 - 1977), San Francisco Giants (1981 - 1984), Baltimore Orioles (1988 - 1991) and Montreal Expos / Washington Nationals (2002 - 2006). He was awarded the American League Manager of the Year Award in 1989 for leading the Baltimore Orioles to an 87-75 record. But the highlight of his career came on April 20, 2006, when he led the Nationals to a 10-4 victory over The Phillies to be become the 53rd manager to win 1,000 games. "I've been very lucky, very fortunate and very appreciative of the opportunities that I've had to do the things that I enjoy doing," said Robinson, who finished his managerial career with a .475 winning percentage (record 1,065-1,176). "This is why I have always respected the baseball, and tried to get others to appreciate and respect this game." But he left the door open for a return to MLB management by stating: "I still have something to offer and give to baseball," said Robinson. "I want to be involved. It gets in your blood. After retiring from the Red Sox in 1960, Ted Williams lived another 42 years and engaged in many of the pursuits that drove him while he played. He fished. He worked for the Jimmy Fund. And he stayed in baseball as a manager, hitting instructor, and goodwill ambassador. Williams left his boat in Florida and agreed to manage the Washington Senators. He signed a deal worth $1.25 million for five years, but resigned after his fourth season, a year after the team moved to Texas, compiling a 273-364 (.429) record. They improved by 21 games in his first season, when he was named manager of the year. In 1978, he was hired by Tom Yawkey as a permanent part of the Red Sox organization, and he came to Red Sox training camp in Winter Haven, Fla., every year to fish and teach hitting. The teaching pleased him. He hung out with his old pal, Johnny Pesky. He worked with minor leaguers and major leaguers. He told them all to use a little uppercut into their swing; most important: get a good pitch to hit. 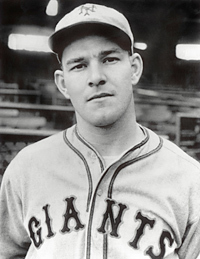 Following the 1941 campaign, amid increasing concerns about the war in Europe and tension with Japan, Giants President Horace Stoneham the team’s hierarchy when he greeted Mel Ott on the first day of Spring Training with a smile and an offer: "Hiya, manager. I have a new job for you, at more money." It took several minutes for Stoneham to convince Mel that he was indeed the Giants' new field boss. But the jubilation faded five days later when the Japanese bombed Pearl Harbor. The first 500 Home Run Club member to become a player-manager of a Major League ball club, Ott hit his final career home runs as a player-manager. “Master Melvin’s first managerial year was a success. His club was no match for the Cardinals and the Brooklyn Dodgers, but the Giants managed a third-place finish, led by Playing Manager Ott, who overcame the burdens of managing to lead the league in home runs, runs and walks, a continuing testimony to the respect pitchers accorded him. In 1945, his twentieth season, Ott hit his 500th home run on August 1 and was rewarded with a multi-year contract. The following year started out on a high note, as Ott his a long homer on Opening Day, the 511th of his career. Unbeknownist to all, this would be the last home run of his career, because the following day, Mel dove for a fly ball and suffered a career ending knee injury. He continued on as team manager and led them to a winning record. A series of bad investments left Foxx broke by 1958. He worked as a minor league manager and coach after his playing days ended, including managing the Fort Wayne Daisies of the All-American Girls Professional Baseball League. Tom Hanks' character Jimmy Dugan in the movie A League of Their Own was largely based on Foxx, but the producers took a number of liberties in creating the role. At the tail end of his career, Babe Ruth's determination to become a major league manager prompted him to turn down an offer from the Yankees to manage their top minor league team, the Newark Bears. Instead, in the spring of 1935 he joined the worst team in the National League, the Boston Braves, as an "assistant manager" and active player, lured by unsubstantiated overtures that he might become their manager the next season. As a player he was all but finished. He reported to the team grossly overweight, which threw his timing off at the plate and made him appear a buffoon in the outfield. There was a slanting terrace in left field in Cincinnati that acted as a warning track near the concrete left-field fence. When Ruth chased fly balls near it, he would stumble, fall, or catch balls in what appeared to be self-defense. On May 25, 1935, at Forbes Field in Pittsburgh, Ruth flashed his greatness one final, glorious time. That afternoon, he hit three home runs; the last one, the first ball ever to be hit completely out of that park! He crushed the ball so convincingly that the Pirate players simply stood and watched it disappear behind the stands. The crowd of 10,000 let loose a mighty roar as the old slugger hobbled around the bases. 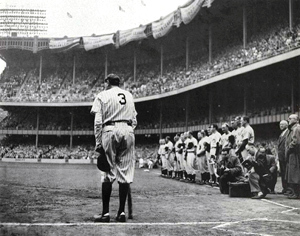 When he rounded third, the pitcher, Guy Bush, tipped his cap to the Babe, who smiled and saluted back. It was the last home run he would ever hit, number 714. At that point in baseball history, no other player had ever hit even half that many. It was a record that would stand for nearly four decades. A week later, Ruth announced his retirement from baseball. From that time until the day he died, he waited and waited for a call from some team, any team, to become a major league manager. A call that would never come. A week after the 44-year-old Reggie Jackson was hired as a cable television commentator for Oakland A's broadcasts in 1991, “Mr. October” was also invited by his former team to serve as a part-time coach. Although Jackson, who spent 10 of his 21 major league seasons with the A's, was known primarily as a power hitter (563 career home runs), he will not be used simply as a batting instructor, but will have general coaching duties, the club said. Years later, in 2004, the other team that he led to World Series glory, the New York Yankees, invited him to serve as a spring training guest instructor. "I'd like to have a meaningful title that would be of value to me and the minority community and separate me in the organization instead of just being a springtime coach. I don't really call myself a coach," Jackson said. "I'm a teacher, a mentor, I'm anything. I'm a big brother, at times, a father, at times, and a messenger, at times. There's no job too menial and, hopefully, they think I'm capable of handling the big jobs. So I want something of value, whether it's baseball ops or that I'm a special envoy." 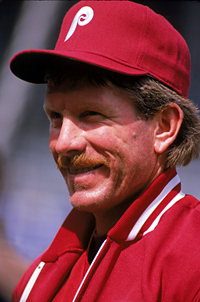 After years of staring for The Phillies, Mike Schmidt approached the team and asked for the chance to manage. And, well, that's part of being Mike Schmidt. He's a Phillies legend. A legend comes in and says he wants a job, the legend tends to get the job. There was some talk at the time that perhaps Schmidt was a manager-in-waiting, maybe even in line to take over the Phillies someday soon. That was never the case; this was really about Schmidt getting a chance to see what this would be like, and whether he could do it. So Schmidt worked one season as the manager of the Phillies' Class-A team, the Clearwater Threshers. Amid snickers that he wouldn't last the year, Schmidt in fact did stick it out for the entire season. And he found out what countless other star players have found out about working in the minors: It's hard, really hard. Managers in the minor leagues eat dinners out of vending machines, they pull the tarps on the field during rain delays, they pitch batting practice in sweltering heat, and they handle mountains of paperwork in sending reports back to the player development people. "There is no doubt, the demands we make on our minor-league personnel are remarkable," said Mike Arbuckle, the Phillies assistant general manager for scouting and player development. Schmidt often acknowledged he wasn't particularly good at this. He was quoted as saying that he was excited about the opportunity, that he wanted to take a team of 25 young men and lead them somewhere. But as the season wore on, Schmidt gave a handful of interviews in various places where he wondered aloud whether he was actually cut out for it. He's a Hall of Famer. He's hyper-competitive. And for five months he worked in a field where winning was secondary to the big picture of developing young talent for the future. And there were times when he struggled. Schmidt, presumably, takes away something, too. He gave it an honest shot, and he found out what he needed to find out. He found out he was better at being Mike Schmidt, Hall of Famer, than being Mike Schmidt, Class A manager. At the very least, it's a heck of a lot easier.